This is a thought that has been stewing in the back of my mind for a few years now. I’m not sure it’s fully cooked, but I’m going to put it out there, and try to defend it with Scripture, logic and experience. Read to the end, and if it still seems undercooked, maybe we can stir the pot a little. What if God is not a glory hog? What if he doesn’t like to be called “the Famous One”? What if trying to boost God’s ego is like giving him an ugly tie on Father’s Day? I try to write novels. When I want to create a sympathetic character I steer clear of arrogance. No one likes an overlord or a braggart. Characters that crave glory are almost always a villain or a fool. If I create a husband and wife that want to have children in order to be served and adored by them, I’m pretty sure those characters will end up in a knife factory during a hurricane. I’m pretty sure those Stepford men who programmed their wives were not considered the heroes of that story. If we instinctively recoil from these kinds of characters, how could we entertain the idea that our Creator is anything like them? We should assume that God is like the characters we are instinctively drawn to, people of humility and honor. 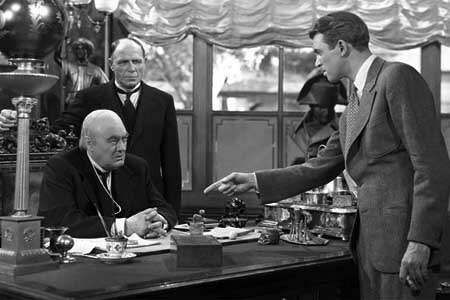 We want George Bailey, not Mr. Potter. This is exactly what we saw when God came in the flesh. Jesus was just like George Bailey, resisting the Mr. Potters of his community—the proud, prominent and wealthy. He even rebuked his own disciples when they talked about their potential glory in his kingdom. Not only did Jesus claim to be “meek and humble in heart,” he demonstrated it, serving the poor and marginalized of the world, earning a universal respect that has endured to this day. But Jesus said that to see him was to see his Father. How can we justify Christ’s humility with Yahweh’s apparent glory mongering? Can we say that the God who presented himself to Isaiah on a throne, high and lifted up, surrounded by angels and radiant light can be considered meek? Would Jesus display his power and wrath by drowning the world in a flood, or thundering down from Mt. Sinai, or burying Sodom in Gomorrah in fire and brimstone? That sounds more like something Mr. Potter would do. Yahweh claimed that he hardened Pharaoh’s heart in order to demonstrate his power, that his name might be proclaimed throughout the whole earth. He insisted that he would not share his glory with another. Gnostics use these kinds of verses to paint Yahweh as an evil demigod that made his own planet and torments its residents. Jesus, however, is presented as a prophet of the true light sent to liberate the unfortunate humans from their evil overlord. Paul, however, would not agree. He encourages believers to do all things, even the mundane, to the glory of Yahweh. David encourages Israel to ascribe to Yahweh the glory due his name. Even Jesus claimed that he didn’t come to glorify himself, but his Father, Yahweh. No wonder so many Christians claim that man’s chief aim is to glorify God and enjoy him forever. I admire the Gnostic’s impulse to resist an arrogant, controlling, wrathful deity. I think they are being more true to their instincts than some believers who are bothered by what they hear, but continue to worship because God is so much bigger or more incomprehensible than they can wrap their brains around. When Eve was made to doubt the character of God, she rejected him. Sadly, many Christians will hear similar challenges to God’s character, but make no effort to justify them. They just lift their hands and close their eyes, approaching God more like worms than children. What if we are unconsciously imposing our own twisted standards and perspectives on these Scripture, distorting their meaning in some way? Doesn’t it seem more likely that one who claims to be a father, a good shepherd, and a comforter would prefer to serve behind the scenes rather than soaking in the spotlight? I read a book in college called “Upside Down Kingdom.” I enjoyed the premise. Jesus came to an upside down world in order to set things right side up. But to all the people here, he seemed upside down. His ways are not our ways. Not even his thoughts. So what would be the natural mode of thinking for a world that Jesus claimed was in darkness, ruled by the devil? Well, we know that the devil loves himself above all, craving power and control. He was punished for trying to take the throne of God. He tempted Eve by appealing to her pride. Look at our world. Even though we applaud the George Baileys of the world, we still put all of our efforts into achieving the status of Mr. Potter. Upward mobility—more money, more power, more status. We idolize celebrities and sports figures, and dream of a similar success. Even churches are not exempt. We pray to boost attendance, boost tithing, build new buildings, launch new programs. When we grasp that next rung on the ladder, we thank God for his blessings. But by all indications from Scripture, God’s way up is down. Maybe our thinking is upside-down, but our instincts are right side up. Maybe that’s why we applaud the right thing in novels and movies, but do the exact opposite in our daily lives, hardly noticing the difference. When we talk about the Incarnation, we think of how humbling it must have been for the Almighty God to take on a fragile, finite human body. We think of him as slumming it down here, doing what he had to do, then getting back to his throne where he belongs. We are amazed when someone like Mother Theresa chooses to leave the comforts of home to serve in the gutters of Calcutta. We think: Well, she’s just storing up treasure in heaven. She’ll get a mansion up there. As if that was the goal all along. Crowns. Streets of gold. Glory. When we hear “glory,” we think fame. But when Jesus claimed to glorify his Father, he didn’t do it by singing worship songs or giving a clap offering. He did it by letting the glorious nature of God finally be seen on the earth, by living out his mantra “not my will, but yours be done.” God’s glorious truth was told. God’s glorious heart and creative power were revealed. Israel saw the fireworks, but they expected an iron fist, not a nail-pierced hand. The Bible claims that Lucifer was the wisest, most beautiful, most talented creature that God made. If he was so wise, how could he ever think he could take the throne of the Almighty God? Did he really think he could win? Some insight might be gained from the story of King David and his son, Absalom. Special mention is given to Absalom’s hair. Apparently he was proud of it. And himself. He would often stand in the city gates and spread rumors about David, trying to steal the people’s allegiance, trying to take the throne right out from under his own father. Sound familiar? When David heard that his son was trying to take his throne, what did he do? He left the city, unwilling to fight against his own son. Sure, his servants cleaned up the mess, just like the angels in heaven, then David, the man after God’s own heart, returned to his throne. Maybe the devil saw God’s meekness and love as vulnerability. So what do we do with Yahweh’s bold claims and displays of power? Think about a parent and a child. Would a loving parent demand respect and obedience? Would a loving parent put their foot down, make rules or give out consequences? Would a loving parent ask a child to say please and thank you? Would they demand forgiveness, enforce discipline and dole out punishments? Absolutely. Maybe the child will misinterpret their parents as harsh or selfish, but we know that’s not true. When Gandalf grew tall and ominous in Bilbo’s house, it was to get his attention. I see the same thing in the clouds and lightning and booming voice at Sinai. The Law was going to be critical for Israel, setting them apart. First impressions matter. What about the Flood, and Sodom, and the Conquest and the Second Coming? Can a God who is meek and humble in heart ever bring such devastation? Well, can a good judge condemn a criminal to prison, or a good surgeon remove a diseased limb, or a good teacher give a failing grade? These actions are the expressions of a good and just God, not a glory hog. And spreading his name across the earth is a good thing, whether by the dramatic plagues of Egypt or just sending a dozen fishermen into the world. God is what the world craves. It’s what we need. He doesn’t turn the spotlight on himself to gain glory, but so we can see the way to joy and freedom. It’s for us. Jesus didn’t walk around demanding to be worshipped, but he did not refuse it either. It’s good for us to worship God. He is absolutely worthy of it. But not because he demands it, or because he is beyond our comprehension, but because he is GOOD. Through and through. This entry was posted in Christianity, theology and tagged glory of God, Its a wonderful life, worship. Bookmark the permalink. In Hebrews 8:7, Paul notes that “if the first covenant had been faultless, then no place would have been sought for a second.” The New Covenant, starring JC, is kinder and gentler. Very few people are struck down. God has already toned down his wrath following the Flood. Then the Lord said in His heart, “I will never again curse the ground for man’s sake, although the imagination of man’s heart is evil from his youth; nor will I again destroy every living thing as I have done.” (Gen.8:21) Abraham bargains with God for the sake of Sodom and Gomorrah, and defers God’s wrath. (Gen.18:23-33) And, when Nineveh repents, God’s lesson to Jonah is: “should I not pity Nineveh, that great city, in which are more than one hundred and twenty thousand persons who cannot discern between their right hand and their left — and much livestock?” (Jonah 4:11) God will have mercy on whom He will have mercy, and this mercy develops as God and Man learn to love each other. So, yes, likewise we develop a love for our children. Isaiah 14:12-14, does not depict Lucifer as taking God’s throne, but he will exalt his own throne above the stars of God. “I will be like the Most High.” Then the temptation is made to Eve, “you will be like God”. We do not want to get rid of our parents, but we do want to impose our will in authority rather than harmony. Jesus notes: “anyone who speaks a word against the Son of Man, it will be forgiven him; but to him who blasphemes against the Holy Spirit it will not be forgiven.” (Luke 12:10; Matt.12:31-2; Mark 3:28-9) The Holy Spirit; God is love; it is spirit beyond personification. Interesting point about the devil raising HIS throne above the throne of God. Yes, that is what we tend to do. We even hope God will lend his power to our efforts as well. When you mention the evolution of God’s relation to humans, are you saying that God’s character is changing, or just his methods, or both? Thanks, Dad. I remember you mentioning how the devil will always urge us to DO something, to BE somebody. I think that plays into our human worldview quite a bit, and can distort our perspective of God’s motives as well. One of the reasons this ‘thought’ feels awkward is because of the Reformed Theology throw-pillow “To glorify God, and enjoy Him forever.” In many ways, we all feel like this is intrinsically true. IF there is a being that is actually MORE real than us (and I’ll get this later), then by virtue of realness that being is glorified by the default. Think of oil and water – not that one is more real than the next, but this is the problem with analogies – but one will always rise and the other will always sink – and this by virtue of what they are. So then comes the question of why worship. Do we A) Worship to make God feel good about himself? Unlikely. We’re given no indication that God needs anything from us (in fact, the Bible is clear that God doesn’t need us). Alright, if not that, then B) We worship to make us feel better – more specifically an act of emotional/spiritual transcendence. There’s no scriptural precedent for this idea – and something about self-seeking worship REEKS of falsehood. Those seem to be the only two options if we define worship as showing up and paying our dues to a being that supercedes us. BUT, if we look at worship as a three-dimensional act (interesting how in Christianity things add up to three), then I think we can make sense of it. And, as most things do, I think it goes back to the beginning. Back in the Garden. If Worship is the literal act of putting ourselves in fellowship with God – be it through singing, scripture reading, work, or really any life activity (i.e. doing everything to the glory of God) – then suddenly, Worship isn’t about building up God’s ego, rather it’s about getting to know God. And in THIS way, the Reformedidians have it right: To glorify God and to enjoy him forever, actually end up being the same thing. But I did I say three-dimensional, and I’ve only brought two sides – the God and Me relationship. But what if Worship had a corporate use. What if it’s not just a way for me to get to know My Father, but also my brothers and sisters? Suddenly, Worship sounds a lot like Adam strolling through the Garden with his wife, Eve, and their Creator, God. This would, obviously, cause quite a stir in my novel. And I think it’s safe to say it’s because the characters are met with the limitations of paper and ink – and they face their own realness. If we apply this logic in the reverse, and God is the writer and we are the Characters in the novel, it suddenly doesn’t sound so far-fetched that we aren’t as ‘real’ as God. And somehow Jesus is both God and Man, completely. Finally, in my novel all the characters exist to “glorify” (draw focus too) what it is I want to say, and no one calls me conceited for that because we all exist on the same level of creation and we understand that the created thing exists to glorify the creator and enjoy its role in the creator’s plan. I’m just grateful that I can’t create sentient things that can rebel against me. This reads like “further thoughts on a theme by John Barnts.” Seriously, I use that “writing myself into the novel” analogy for the incarnation in my classes all the time, trying to get them to understand the shadowness of the created world, and the marvel of the incarnation. I agree that a person (which God is) craving worship must be seen as an insecurity or weakness, which we know is not true of God. Therefore, it must be about something else. And since the Trinity is the ultimate example of the love and unity of free persons, it would make sense that worship is more about interpersonal, three-dimensional relationships than simply wanting people to tell you how great you are. So why did you leave Mississippi? Not cool, man. Not cool.